It was last fall that a friend recommended I read Edmund de Waal’s The Hare with Amber Eyes. How right he was! I didn’t get around to buying it until March, but from the moment I started reading it I only put it down for the most urgent of professional obligations and bodily requirements. It isn’t precisely a book about Vienna, but there is a lot about Vienna in it nonetheless. And it is riveting. Most of all it is the story of a family and of the author’s search for his family history, set off when he inherited a collection of small Japanese figurines called netsuke. This search takes the author–a world-renowned ceramic artist who, unfairly, also writes exquisitely–from his home in England to Japan, where he gets to know one of his great-uncles better, to Paris of the late 19th century, to Vienna, and finally to the starting point of the family saga, Odessa. In the course of the book one realizes that de Waal knows how to do original research and that he was probably doing his research in the original languages–Japanese, French, and German–at least until he got to Odessa, where he mentions hiring a translator. This gives the book an immediacy and a weight rarely achieved in people’s explorations of their own family histories. The whole book is wonderful but living in Vienna as I do the long section on the branch of the family in Vienna was most alive for me. The cafés, schools, and streets mentioned, the Opera, the Palais Ephrussi at Schottentor, the pace of life, the food, the people described … they are all familiar to me, even though de Waal is writing about the first half of the 20th century. It was a tour through the city I love, offering me new perspectives for better or worse. In the preface de Waal plainly states that he doesn’t want to write “… some elegiac Mitteleuropa narrative of loss” and he doesn’t. When the family’s life in Vienna ends abruptly with the Anschluss in 1938, however, and he portrays Viennese anti-Semitism in the details of its viciousness it moves me more than all the accounts I have ever read about Hitler’s march into Vienna and the waves of violence and pillaging it unleashed against Jewish families. It made me accept what I never could before–that many Viennese, in fact probably the majority, welcomed Hitler and Nazism not just because Austria was in such political chaos that they were relieved to have “a strong leader” (a point de Waal, in a striking spirit of fairness, mentions) but because Hitler spoke a message of hatred and envy toward the Jews that resonated so thoroughly with so many of them. But it is doing injustice to the book to focus too much on that one point and to turn the story, against the author’s explicit will, into a narrative of loss. A quick re-visit of its pages reminds me of how he brings everything–the various backdrops to the story, the people, who in spite of follies are never censured, and above all the netsuke themselves–alive through his descriptions that are carefully detailed but never too heavy. The netsuke could just have been a clever jumping off point to his family story but they remain, in fact, the focus and thread throughout, giving insight into the people who touched them, representing the very essence of craftmanship, and providing joy to the reader as they must in real life. A journey for which de Waal allowed himself one year ended up taking closer to two years, and we are the beneficiaries. I recommend the book now, in my turn, most highly. Perhaps even more than the music (which one can find in other livable cities, although rarely in the quantity and quality one has here) I love the Vienna Woods. It is possible, even easy, to get on a tram or bus, ride out to the last stop, and take a three- to four-hour walk through woods and meadows, rambling up and down hills as you go. 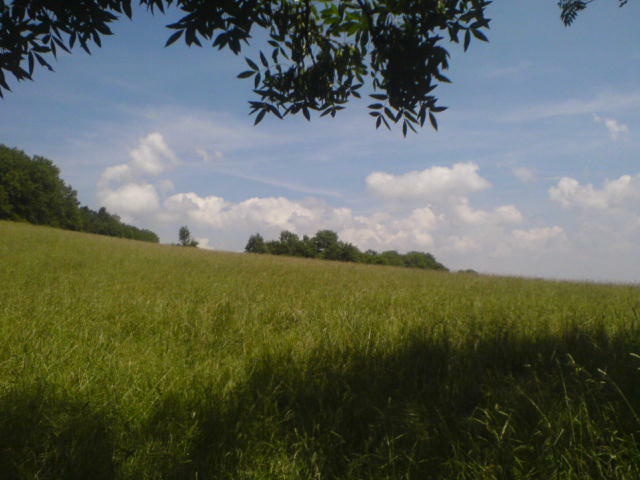 The photo above was taken this afternoon along the Stadtwanderweg Number 2, as an illustration of what you can see even within the city limits. A “Stadwanderweg” is a “city hiking path”–or perhaps “municipal hiking path” as they are almost certainly maintained by the city of Vienna–and there are over ten of them, depending on how you count them (link to official site below). I had never done the whole Stadtwanderweg 2 before, although I’ve done bits in connection with other hikes. It starts and ends in Sievering, one of the most beautiful outer districts of Vienna. Like Neustift am Walde and the even better-known Grinzing, Sievering is an old vineyard and Heuriger or wine tavern neighborhood. Unlike Neustift and, above all, Grinzing, Sievering has retained most of its old charm. Perhaps the streets are too narrow for tourist busses? Or perhaps property prices are too high for riff-raff. The hiking path itself is 10 km, well sign-posted for the most part, gentle in incline, and lined with beautiful views. It also has more than its fair share of Gasthäuser, all with impossibly Viennese names like the Grüß Di Gott Wirtshaus (loose translation: the May God Greet You Tavern). I didn’t find anything to pick this time of year, but from experience I know that come late summer and early fall there will be mushroom seekers and walnut and berry pickers. This will not be my last post on the Vienna Woods so I’ll leave this here for now and return to the topic another day. For those who haven’t been following current events in Europe, at this writing 22 people in nothern Europe, almost all of them in Germany, have died of a new strain of E.Coli. What was the first reaction in the media? “It’s probably the Spanish cucumbers.” When this statement could not be backed up by any evidence, the suspicion was switched to German soya sprouts, although there is currently no proof that it was the sprouts either. This first assumption was made easier by the reputation Spanish veg has in northern Europe–dangerous because it contains high levels of pesticides and other chemicals. But the reaction–“They did it. They are responsible.” –is a very common reaction when something goes wrong. We don’t want to believe that our compatriots could be careless, incompetent, or dirty so we blame others, even if we have little evidence. Blaming others is a natural reaction but not always a helpful one. That the vegetable industry has suffered as a result of the outbreaks (vegetable sales in Europe are down about 35% according to the International Herald Tribune) is perhaps inevitable, as people will try to protect themselves until there is some clarity. The fact that the Spanish farmers suffered disproprotionately shows one of the costs of this knee-jerk response, especially for Germany who may be required to pay compensation for that.